Do you need editing services to fulfill your dream of publishing success? Of course you've done the best you can with your writing. You may even have asked Aunt Cindy; Mrs. Brown, your English teacher; or your best friend Jim to give you comments. As a self-publishing author, you may be in a hurry to get your words into print or online. Publishing houses hire editors to make sure their authors produce the best books possible. As an independent writer, you are on your own to find professional support. Hold yourself in check and get the help you need before you go to print. What do you need to make your self-published project the best it can be? Each project needs its own unique combination of editing services. substantive editing for an overall critique that shows your troublesome writing habits or saves you from making fatal errors in structure? line editing to make your writing consistent, smooth, and compelling so your reader moves effortlessly through your material? copy editing to correct the grammar, spelling, and punctuation so your book doesn't look like a bride with ketchup on her dress? educative editing, a service that uses your own work to guide you to a life-time of better writing that will give you ongoing confidence in your own writing based on knowledge? You will find all of the above right here. Read the testimonials from enthusiastic clients so you can easily see what others have thought of my editing services. There are other recommendations at LinkedIn. When you are ready to work with me, we begin with a sample edit on a short piece of your writing. Your returned edit also includes an individual quote for the full range of my services. 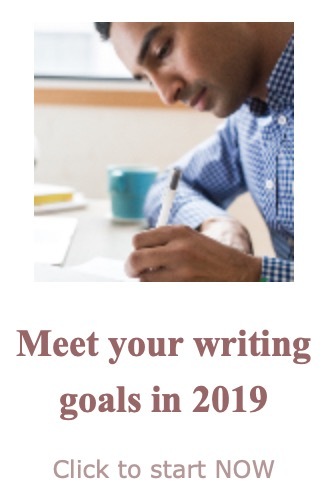 In one go, you discover important ways to improve your writing, you know what I can do for you personally, and you know what it costs to edit your project at the level you choose. writing tips so you, the author, can create clear and compelling text with ease and elegance. information on editing and publishing to put you ahead of the crowd in the rush to self publishing. writing courses, some free, to meet your individual needs. a free newsletter to inspire you and to give you additional information not on this site. If you move with the times, click the like button on the Facebook page WritersHelperEditor where you can interact with me and with other writers. ...use the search box to find exactly what you are looking for. This site keeps growing over time. If you have a question or idea to share, you can post it directly to the site through the Writing Community page. Sample Edit: Minimal Fee Or Free? A sample edit lets you test-drive Writer's Helper editor's service and assures that the quote is tailored to your writing. Learn how to get your sample edit for free. Finally, information for writers on how to self-edit! Editing secrets revealed by a professional editor. The craft of writing continues to challenge even the most experienced writers. Read tips on a wide range of topics of interest to serious writers. Resources for the writer, including gifts others can give. Follow links to pages within Writer's Helper Web site and to other sites of value to find the best resources available on the Web. The writing contest everyone wins. Receive a 100-word critique on all submissions. 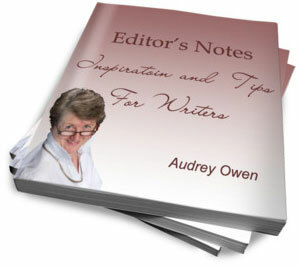 Audrey Owen, editor at Writer's Helper, offers free writing courses from her site. Learn how to write correctly, and powerfully. One specific course on writing for the Web. Editing services FAQ answered by an editor. What would you like to know about editing? A self published author is more susceptible than other writers to the dangers of writing alone. Share the stories of other self published authors. Submit your own story. Book reviews: Reviews of books by self publishing authors. Includes links to services self publishers need: printers, illustrators, editors. Meet the Writers' Helper who offers custom-designed editing services, with a sample edit. The site map guide to all pages at the Writer's Helper Web site. Check out editing services. A subscription to Editor's Notes, a free newsletter for writers, with a slant to self publishers, comes with a gift: a Tip Sheet on how to best use Word's Outline view. Reach the writers in your market when you advertise on Writer's Helper Web site, one of the top 1% of Web sites worldwide.